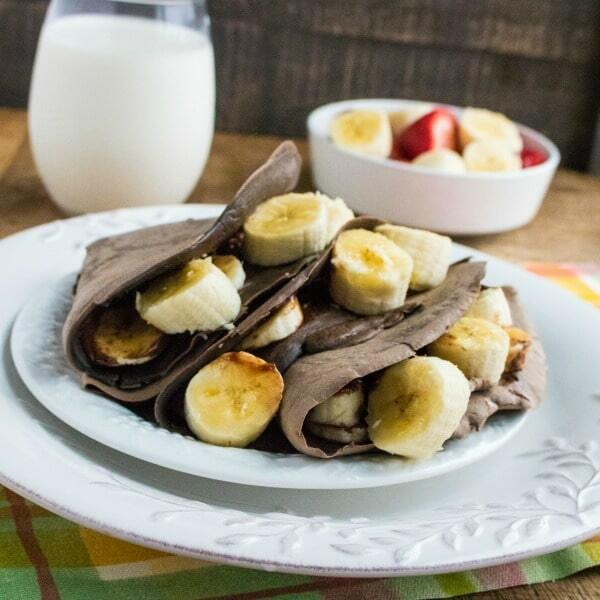 Chocolate Nutella and Banana Crepes combine some of my favorite flavors. This breakfast crepe recipe will become a family favorite in no time and also works great for brunch. Crepes are basically just flat pancakes. The main difference between a crepe and a pancake is that crepes do not have a raising agent like baking powder or baking soda in them like pancakes do. Crepes come from France and have quite a history. There is actually a “Day of the Crepe” in France on February 2nd each year! Crepes have become very popular in the US too and I have been seeing them more and more often on restaurant menus. One thing I love about crepes is that they are so versatile and can be made sweet or savory. It is no secret that I lean towards the sweet crepes like these Chocolate Nutella and Banana Crepes! I have had people tell me that they are afraid to try making crepes at home. Some people are under the impression that it takes culinary genius to make crepes. I am here to tell you that is absolutely not true. There are no special culinary skills in my resume and I am able to make up a batch of crepes with no trouble at all! Don’t be shy and just try it! 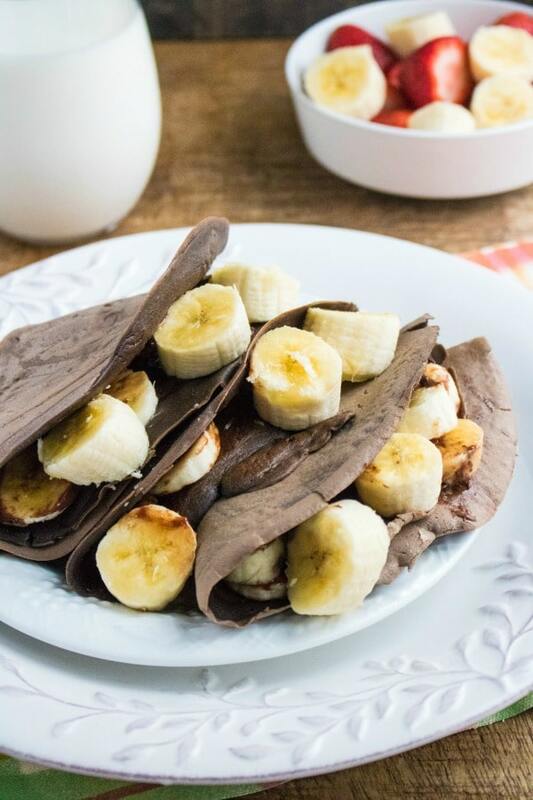 These Chocolate Nutella and Banana Crepes are so worth the time! The first step to crepe making is to mix up the batter. Combine the milk, eggs, oil, vanilla, flour, sugar, baking cocoa, butter and salt in a blender . Blending the batter ingredients in the blender makes the batter nice and smooth. This step is easy, but important. The skillet you use needs to be heated before you start. I like to use an 8-inch nonstick skillet . Heat the skillet over medium-low heat and spray it with nonstick cooking spray . It is time to pour the batter into the skillet. Pour about 3/4 of a cup of batter into the 8 inch preheated skillet. Pick up the pan off the burner for a minute and move, tilt and swirl the batter around so that it covers the entire bottom of the skillet all the way to the sides. Let the batter cook until the top is noticeably cooked. Then flip the crepe over and cook the other side so that it is lightly browned. Repeat this process until you have used all the batter. After each crepe is done cooking just set it aside on a plate. Be sure to put a layer of parchment paper in between each crepe so they don’t stick together. The fun part begins now that the crepes have all been cooked. Take each crepe and spread Nutella over one side of the crepe. You can add a thin layer or a thick layer! Then slice up a banana and layer some banana slices over the Nutella. 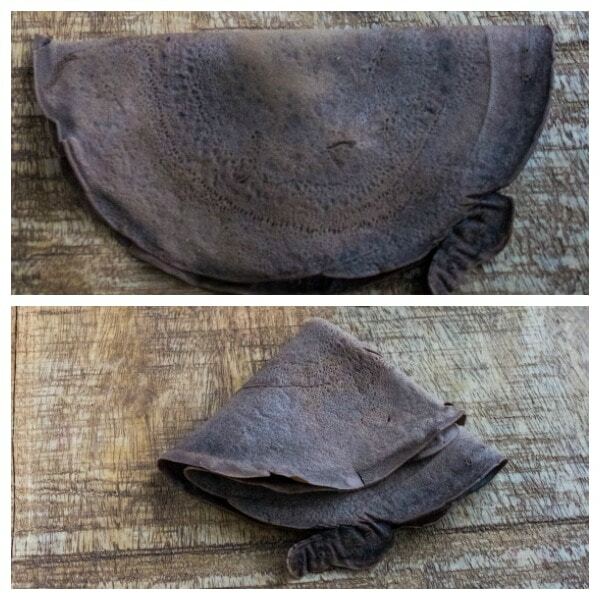 Fold the crepe or roll the crepe up and it is ready to serve. 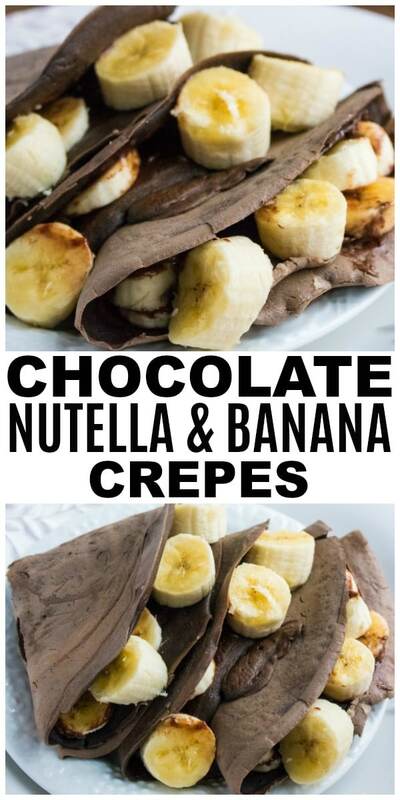 If you want to really dress the Chocolate Nutella and Banana Crepes up even more you can add toppings like powdered sugar , more bananas, whipped topping and even chocolate syrup . 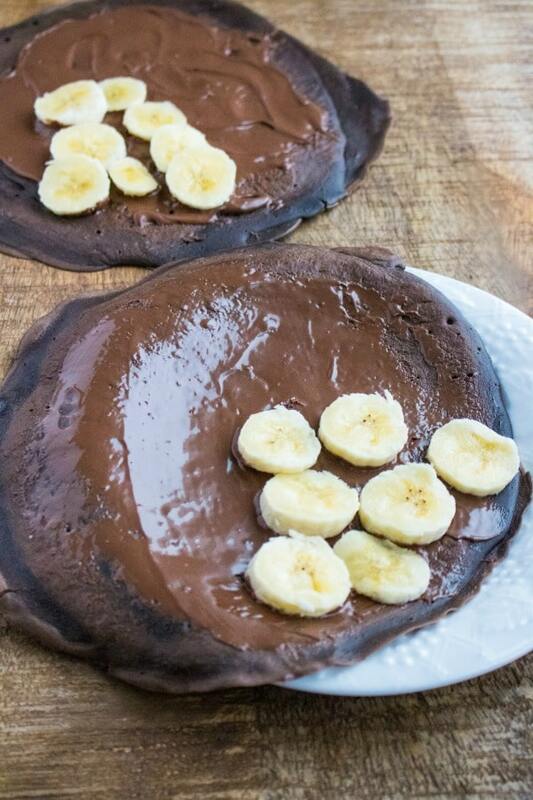 There is no doubt you are anxious to make this Chocolate Nutella and Banana Crepes recipe. You can download and print off the entire recipe from the recipe card below. 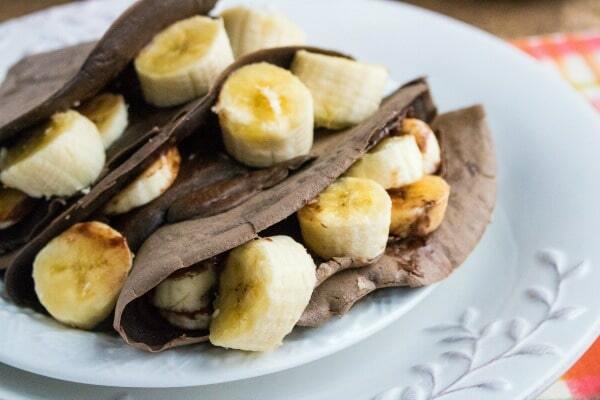 Chocolate Nutella and Banana Crepes are decadent and delicious. The combination of flavors is just plain wonderful. 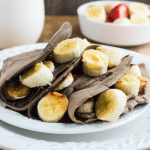 Be sure to PIN this recipe for Chocolate Nutella and Banana Crepes so you can come back and make it again and again! Nutella and bananas are SO good together!